With Facebook Ads, the key is to NOT present your audience with JUST an optin page. If you need better results, always try a different angle with a different page. In an effort to better our results with Facebook ads (hopefully) I decided to launch a list building quiz using OptinLabs. In today’s “15-Minute Sprint“, I explained how to better leverage existing assets and lead people to take action, and then started a quiz from scratch and completed the list building quiz. I’ve covered this earlier too, but I really want to hit home this point. 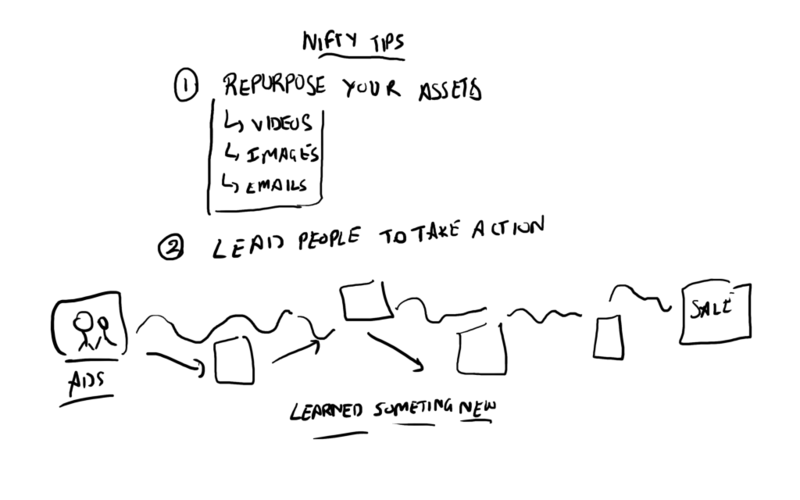 Use these assets in multiple ways in multiple funnels – just because you OWN that asset. It’s a creative that you created in your own time. Like the selfie image of me holding the napkin sketch. It’s just a plain selfie shot. Just look how we took that ONE photo and just went wild with it. I added all sorts of emojis on it to make it look unique. I cropped it – made it a wide shot. I kept a rectangle and square shape. I made it black and white. Takes a few minutes of editing – and we now have MULTIPLE creatives to use at will. How do you make that transition. To understand better, you need to understand TRAFFIC TEMPERATURE. Cold, Warm, and HOT traffic. Your messaging needs to be based on WHERE the traffic is coming from and their TEMPERATURE. In any case – your goal is to LEAD people to click, learn, read, watch – basically ENGAGE with your business at many stages – and then finally close the sale. The number of steps is lesser if you’re selling a low ticket product. But since we’re selling a high ticket product – we need to EARN their trust and give them more than just an optin page. If you want to learn how to write better copy and understand how copy ties together your funnels – definitely check out Copywriting Academy. Keeping these nifty tips in mind – I embarked on my 15 minute sprint to launch a brand new quiz. This title is generic enough to target wide audiences on Facebook and then the main goal was to LEAD people who were taking the quiz to the “napkin sketch”. If you see the video of me creating the quiz above – you’ll notice the flow of questions that lead people from passive business, to the napkin sketch teaser, then the optin form, the muted video to bring curiosity, and then finally revealing the napkin sketch. It’s a pretty sweet flow. I learnt from Anik after all 😉 BTW, have you joined Inbox Blueprint 2.0 yet? Can it be made better? YES. Do we have time to make it better in this Bizathon? I don’t think so. 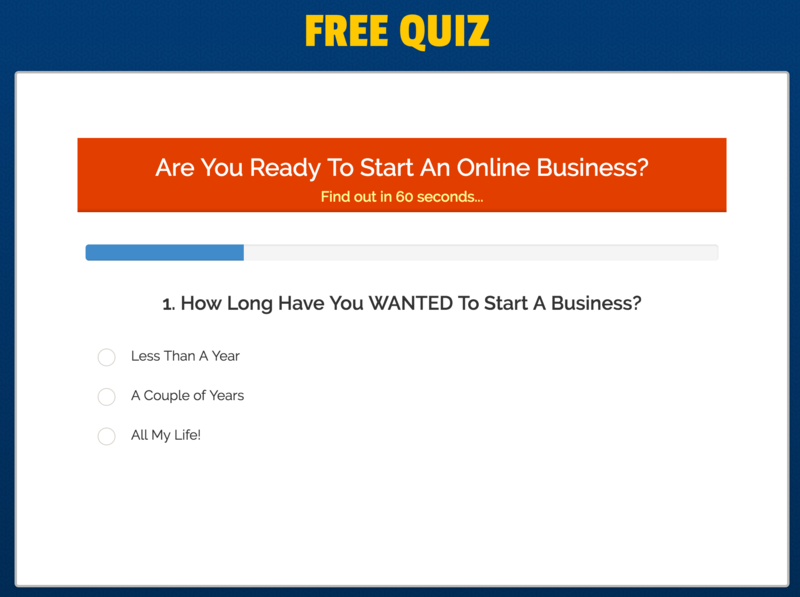 We’re going to stick with what we have and then embed that quiz on a ClickFunnels page with a catchy headline. Next up, we will be starting Facebook Ads for this quiz.